We awake a little blearily, however are both surprised we don’t actually feel as bad as we feared. 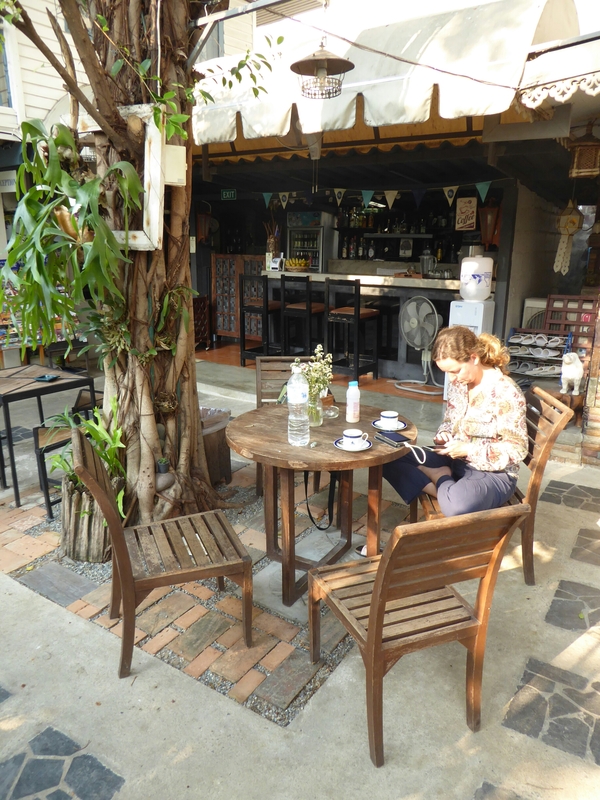 I google best coffee in Chang Mai and we follow MapsMe to Overstand, a coffee house, run by an Aussie. 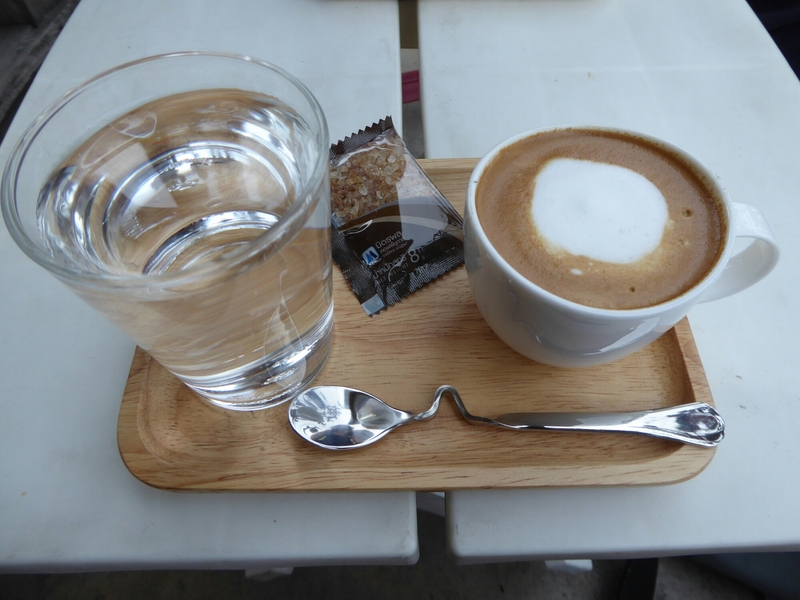 The coffee beans are arabica from Northern Thailand (in case you need to know! ), it is robust flavour, not dissimilar to Laos coffee. We also treat ourselves to brunch. 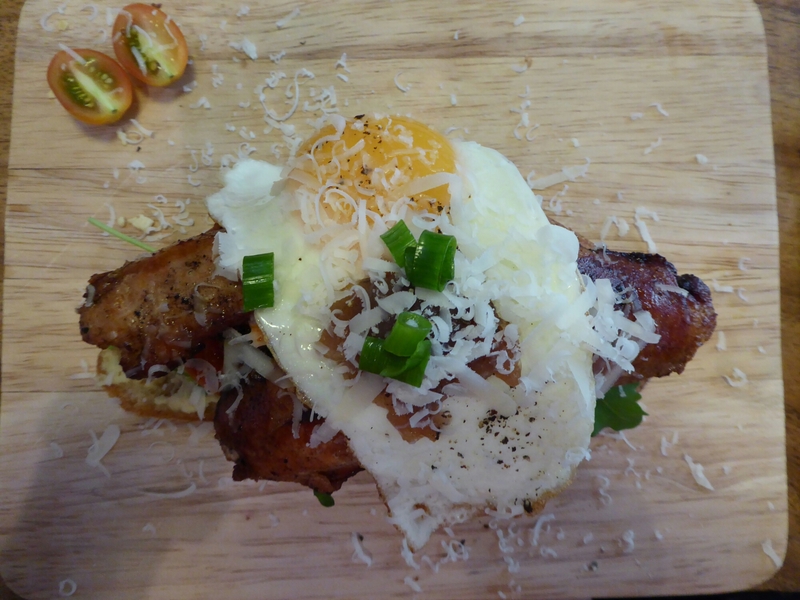 Chorizo, herbed tomatoes, hummous parmesan eggs on sourdough bread. The sweet, spicy taste of the chorizo is like a familiar old friend we haven’t seen for ages and had forgot quite how special they were. 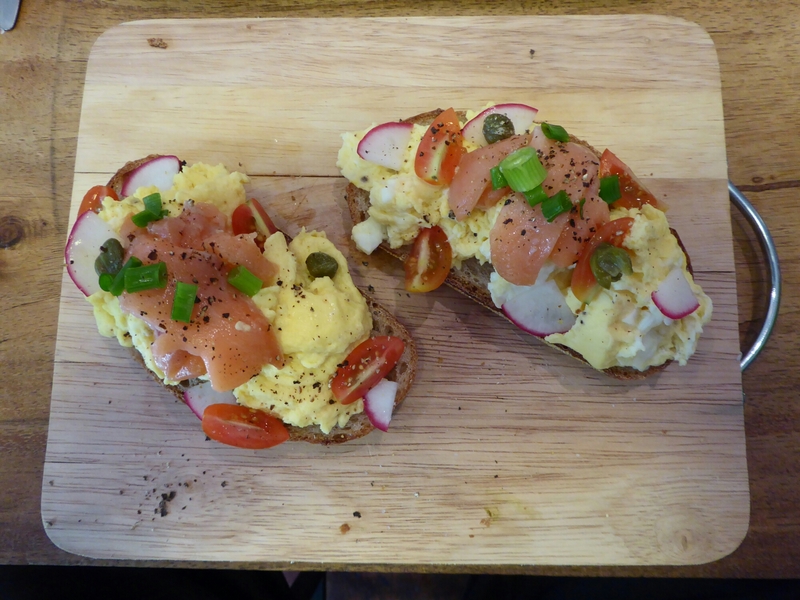 We also have salmon, eggs, radish, capers on sourdough. It’s been a long time since we ate off a wooden board. Oddly enough, for a hangover, we both feel like shopping. Usually the thought of shopping is enough to send me to the pub, but we get Guys wallet out and have some retail therapy. Several dresses, items of jewellery and hats later we have our daily visit to Boots. The first time we went into Chang Mai Boots we thought there was some Chinese geocashing going on, it was rammed with Chinese youth. 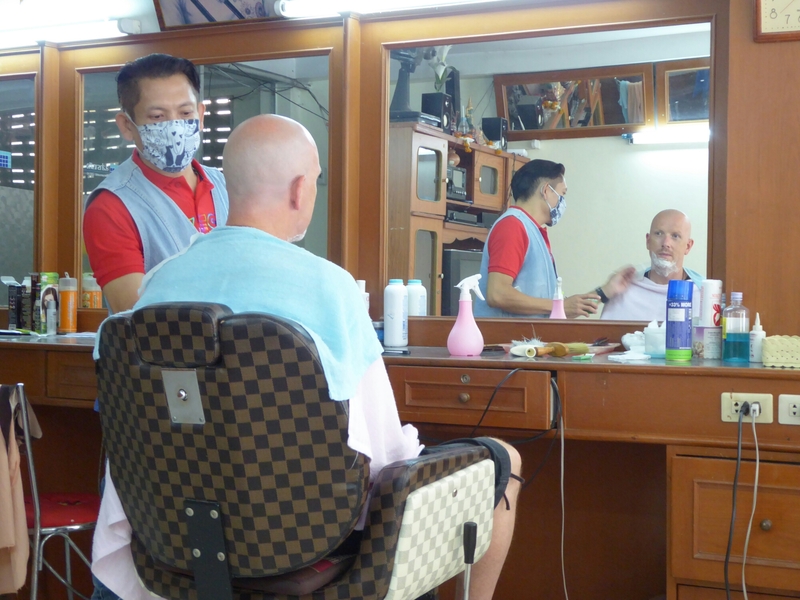 Now we realise they have no Boots so need to buy up baskets of whitening creams, make-up etc.before going back to the Non Boots China. If Boots were in China they would make a fortune. Shopped out, and ever so slightly concerned at how the hell it was all going to fit in the rucksacks, we found ourselves in a restaurant with a bowl of Khao Soi and a couple of Leo’s. 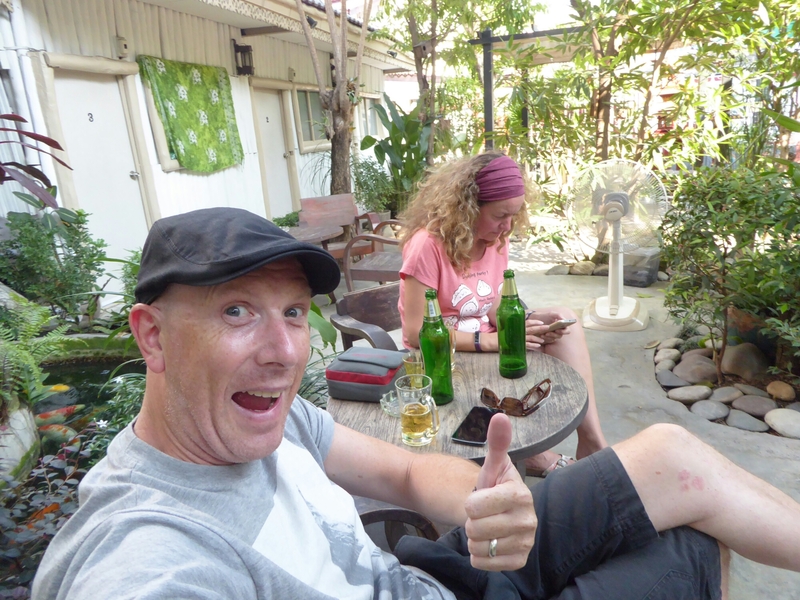 Our hostel has a beautiful little garden, so we sat in dappled sunshine, admiring the koi in the pond and enjoyed a Chang, or maybe 2. An entertaining half hour was spent WhatsApp’ing friends in Ireland on their way to work. Guy had planned to go to a meditation evening, it was something he had looked forward to all week. However, beer and meditation don’t mix. He decided to live in the moment and have another beer. 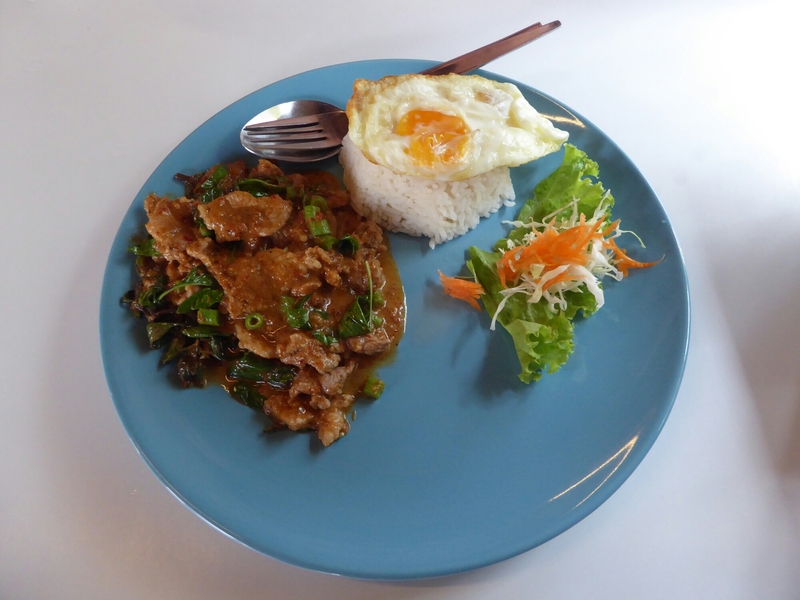 We wanted to try Lanna food again, so we go to Huen Phan restaurant. We have a grey curry of bananas flower and pork, it is fishy tasting. 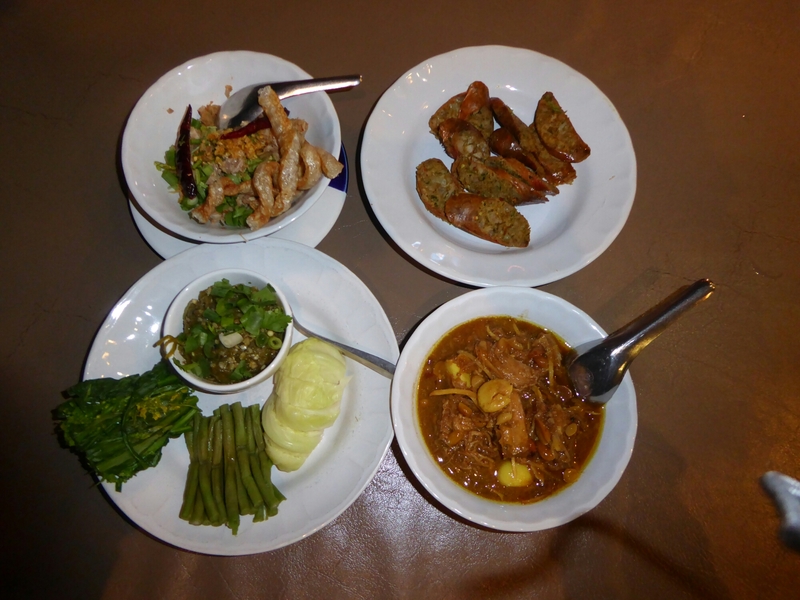 A Nam Priik with fish which is tasty, a raw looking pork and egg fish which tastes ok but I can’t get over the look of it, sausages which are lush, and baby aubergine salad which is fishy and spicy. We both agree we are not keen on this cuisine and have a Mai Tai (Guy) and GandT (me) to celebrate this discovery. We end up in a bar round the corner from our hostel, it has live music on and expensive beer. We are about to be sensible and call it a night when the guy plays Radiohead. It ends up being a late night with many beers being drunk and many conversations had. This morning was a repeat of Monday, yoga for me, peace and quiet for Guy. Lunch was at a restaurant across town, it had opening hours of 10 -2. I would love to work in that kitchen. 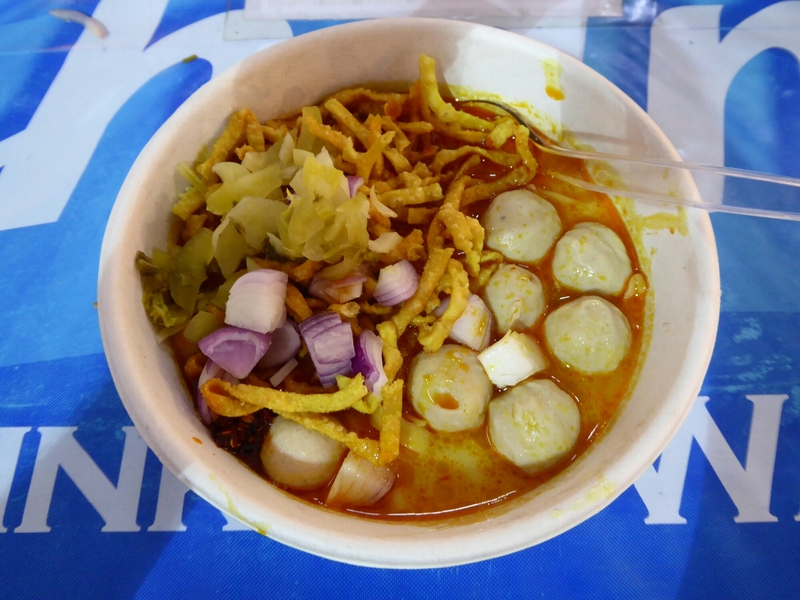 It is a small street stall selling 2 items; Khao Soi, a Chiang Mai curried coup, and Tom Yum. We order one of each and wait. Every table is full, the turnover is quick, you sit, order, eat and go. Someone takes your place straight away. The sign of a good street stall. 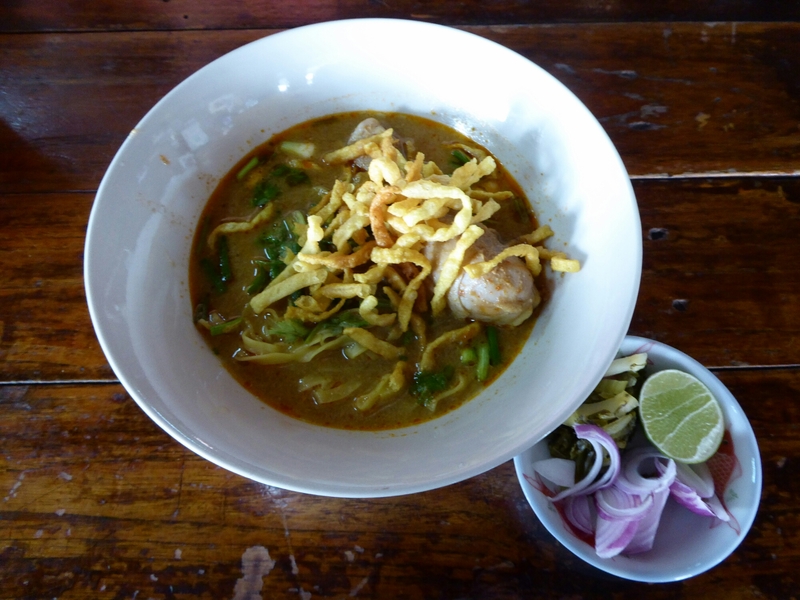 The Khao Soi was creamy from the coconut, spicy with chilli, rich from the crushed peanuts, it is accompanied by a wedge of lime, pickled green and raw red onion. Only the raw onion remained a few minutes later. 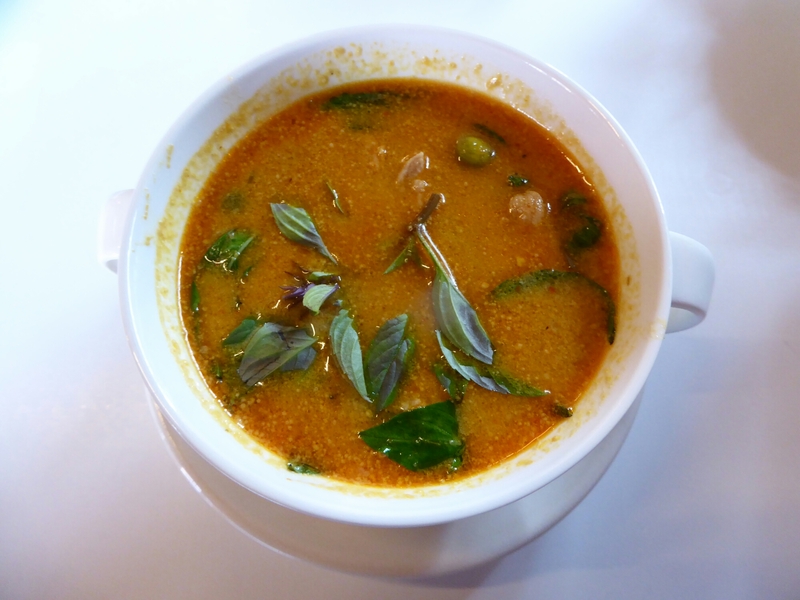 The Tom Yum is equally well balanced, sour and spicy and we do our usual photographing and sharing of food. It doesn’t take long to eat and we make room for the next clients. Slow meander back through town, and we take it easy for the rest of the afternoon. Evening meal is at a Lanna restaurant, near the student area of Chang Mai, about 3km from our hostel. 3km at home is usually walked in 40 mins or less. 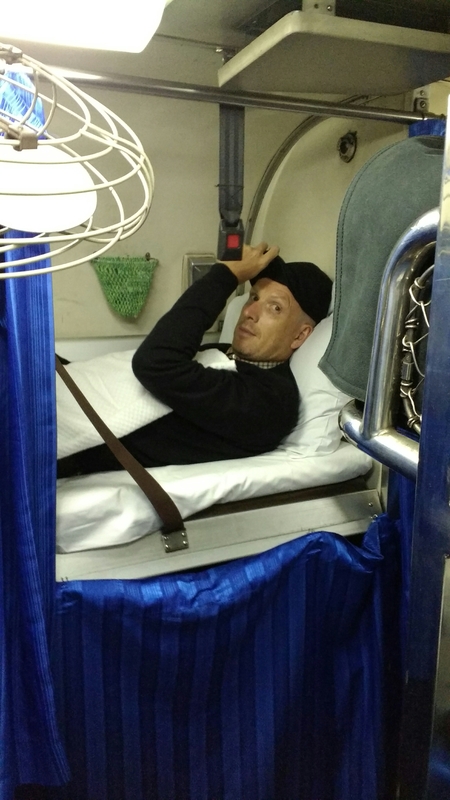 Here is takes longer due to obstacles, trip hazards and generally walking at a slow pace due to heat and the fact we are both so chilled out we cannot get above 2nd gear. We continue our walk to the restaurant, it is ‘bird bed time’, the birds are noisily chattering away in the line of trees we are walking under, the noise is incredible. I can’t believe we didn’t get one bird pooping on us. The restaurant has the usual queue outside it. We are given a number and menu and wait for about 40 mins for a table. 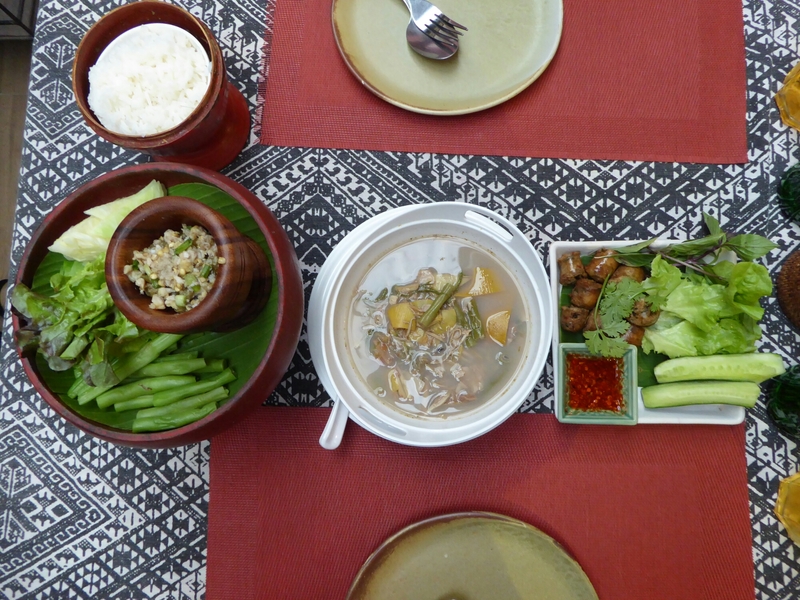 Lanna food is from the north of Thailand and Burma area, it is made up of lots of vegetables, and a heavy hand of fish sauce. We are adventurous in our choices and order Burmese pork curry which is tasty and delicous, similar to a mussaman curry, ant egg and herb soup which is fiery, ants egg’s are tiny (unsurprisingly) and taste of the soup, green chilli Nam Priik, which is a chilli paste dip eaten with steamed vegetables, young jackfruit salad which is spicy, hot, sour and good. 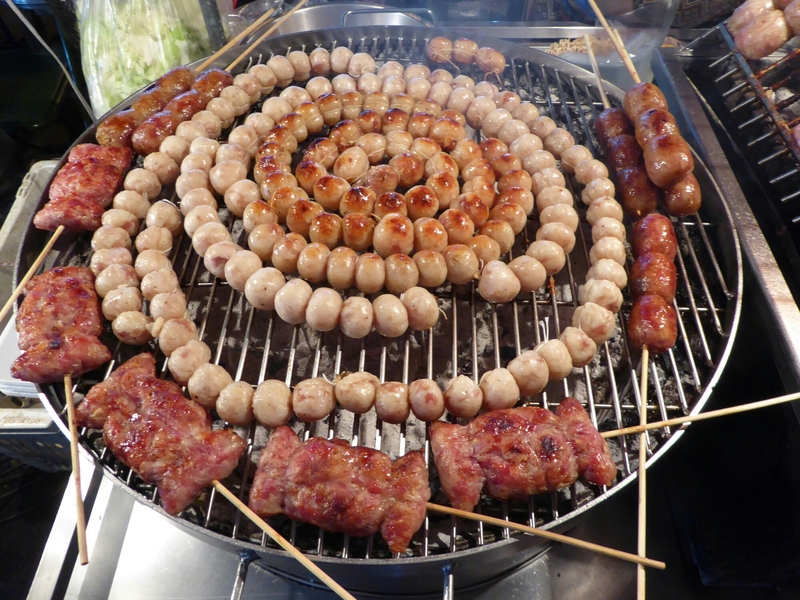 Finally we have the local BBQ sausage, we can’t resist them, it is pork and lemongrass and fab. 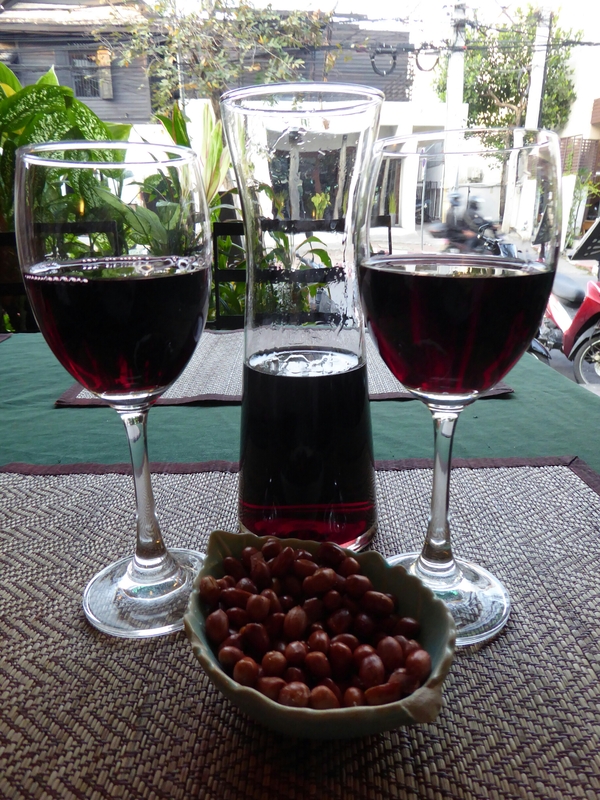 It is an interesting experience, the heavy use of fish sauce reminds us of Burmese food, which we struggled with. But it is just the right side of fishy to not be revolting. 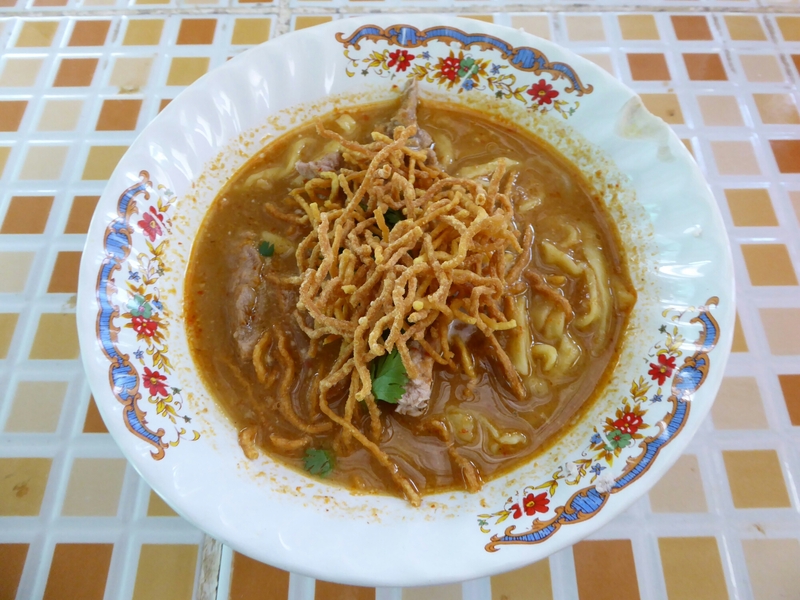 Isaan or Southern Thai food is still preferable. 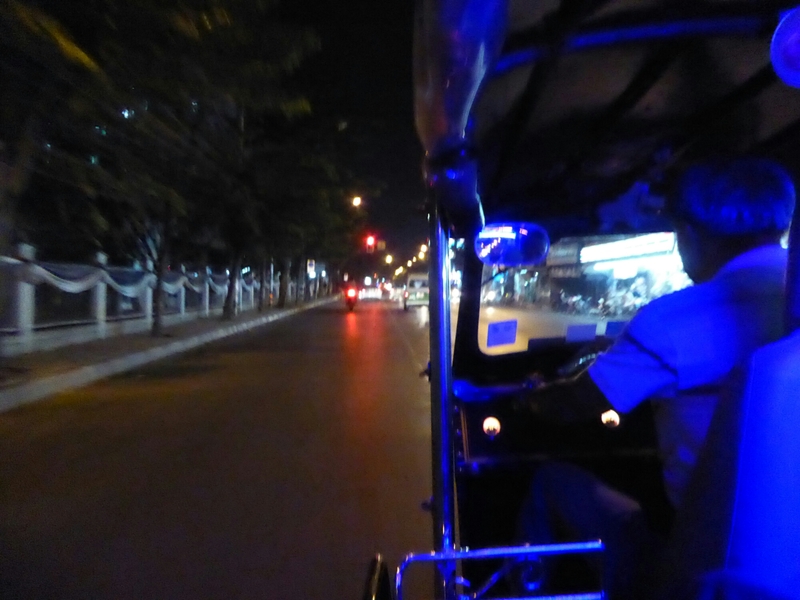 I have a massive blister on my foot so we treat ourselves to a tuktuk back to the night market near us. We negotiate the price, have the usual feeling of being ripped off, then zip along the roads feeling like you are being driven along by a hair dryer. The market is full of tourists looking for a bargain buying patterned clothes. I do wonder what Thai people think of our dress sense, all the ‘ferang’ loll around the country in tie dye, brightly coloured clown trousers, hippy bags and gaudy tops. I hobbled around, then pleaded to go home, we had a beer in our garden. The hostel owner was sat with two friends enjoying their second bottle of johnny walker and a german family were enjoying a bottle of Thai rum, so we decided it was time to fit in. Guy went out and purchased a small bottle of Thai rum and we chatted away under the stars, putting the world to rights. 14.2.2017 Chang Mai… There’s a Rat In Me Kitchen…. We had an early morning wake up by a Willy Nelson sound-a-like in our court yard. He had had a couple of ales, and maybe other intoxicants. Our hostel owners seemed to know him and kindly helped him out. His gravelly voice could only come from many years of smoking, you can only wonder at the life he may have had to end up here, in that state. Today was the day of our first Qi Gong lesson. We walked across town and were 2 of 6 people in the group. It was a lot of arm waving. Not sure we got much out of it, but we are prepared to try it again. Guy was in need of a haircut, and not wanting to risk multiple mossie bites doing it himself at ours decided he would treat himself to a razor cut. The razor was sharp, the barber careful, he emerged shiny and unscathed. 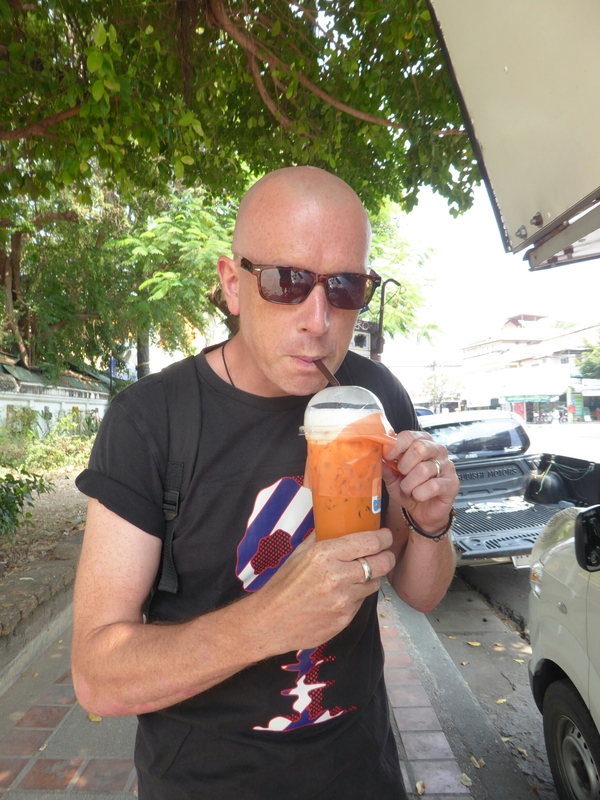 A bit further on Guy stopped for another treat, a Thai iced tea. We have had 5 days of no drinking coffee or alcohol, and this tea just set him off chatting, he didn’t stop for the next hour. I listened, politely. We were on our way to Blue Diamond cafe, they promised avocados galore. The menu was so refreshing, full of salads, avocados, tuna, bacon, and lots of western food we haven’t had for months. 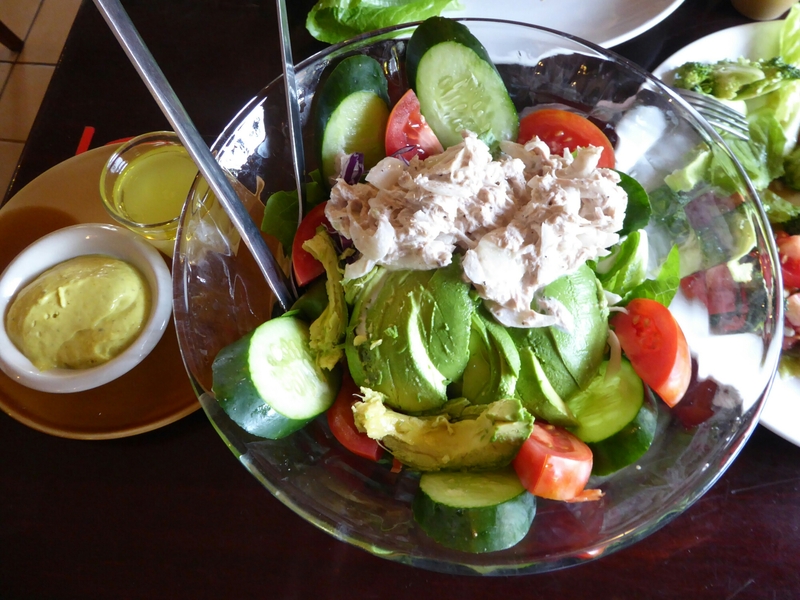 We had a broccoli salad, tuna salad, bacon and avocado whole-wheat cob, and a tumeric tea. It was healthy, fresh, tasty and western prices. A great treat, once in a while. Guy wanted to see some Wats so navigated us around them in the afternoon. They were quite different, first Wat Chang Man, believed to be the oldest. 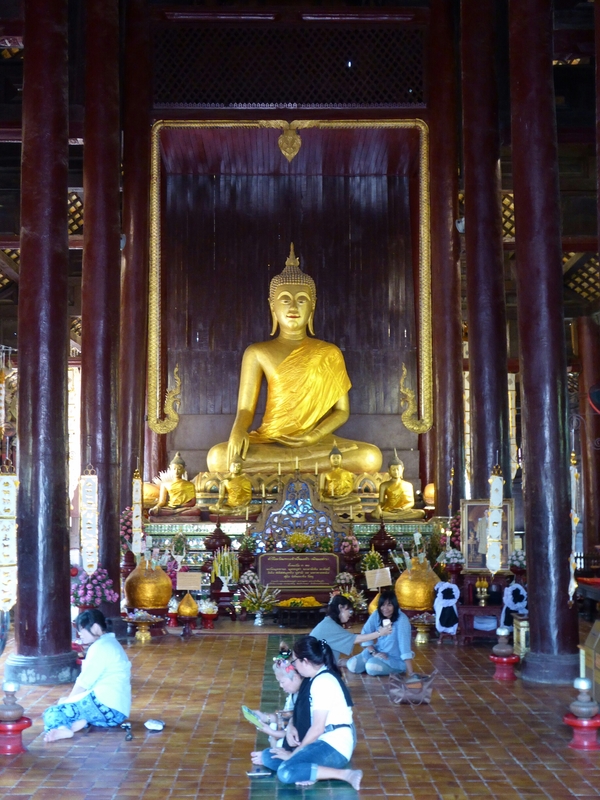 Second was Wat Pha Tao, not too old but made of teak and beautiful. 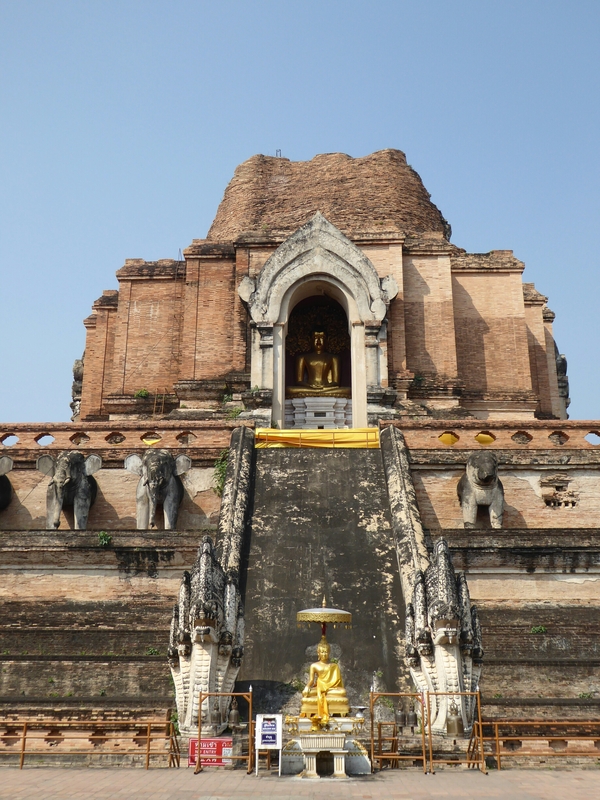 Finally was Wat Chedi Luang, a massive structure dating from 1441, which we sat on a bench and contemplated, for some time. A rest beckoned, and once darkness had fallen, which happens about 6.30 here, we were on the prowl for a Cowgirl selling pork. She was easy to find, the hat and queue of Chinese tourists gave her away. We waited patiently for 2 portions of juicy, pork knuckle on rice with pickles and chilli sauce and ate it with gusto, it was truly delicous, although we both probably could have had it without chilli sauce. It cost £2.50 for 2 portions. On our journey to the Cowgirl stall we had passed some good looking dumplings (are there any other kind of dumplings???) so stopped for them, and bacon wrapped enoki mushrooms at a Japanese food street stall. The food was really tasty and we were full. Author Al RobertsPosted on Feb 18, 2017 Feb 20, 2017 Categories ThailandTags Chang Mai, cowgirlLeave a comment on 14.2.2017 Chang Mai… There’s a Rat In Me Kitchen…. I had a vinyassa yoga class at Freedom Yoga at 10am. It was sweaty, very sweaty, I haven’t don’t that much sweating since we had yoga class in Kenilworth in 30 degree heat last summer. I loved it. The instructor, Nick, was really good, talking you through all the moves and very encouraging. He made my downward dog much better. Guy enjoyed sometime on his own in the garden of our hostel. 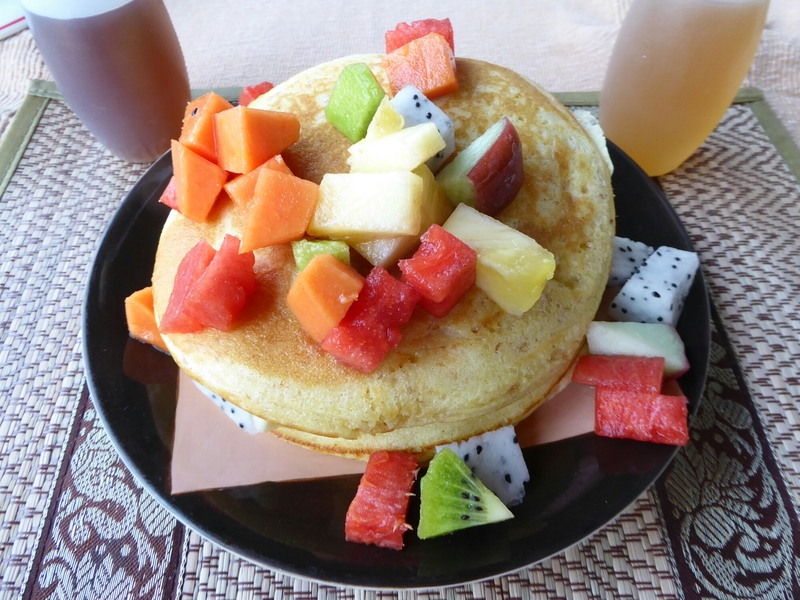 I think he enjoyed it more than I enjoyed the yoga…..
We had brunch in bland tourist restaurant, whole-wheat pancakes and fruit for me, lemongrass chicken salad for Guy. We walked 3km to train station to buy overnight train tickets to get us back to Bangkok. The walk took us down motor mechanic street, not many other tourists were doing this walk. But as usual it was interesting to see life outside of the tourist bubble which is the Old Quarter. The bridge out of town had beautiful flowers, mainly petunias, at nose level as you crossed the traffic congested bottle neck. Dinner was at Warorot night market, near China town. It was a small market and not particularly great. 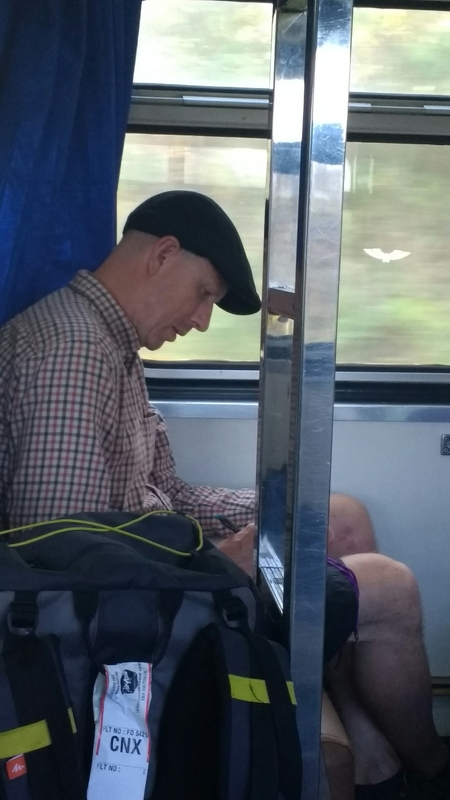 Guy indulged in sausages….for a change. 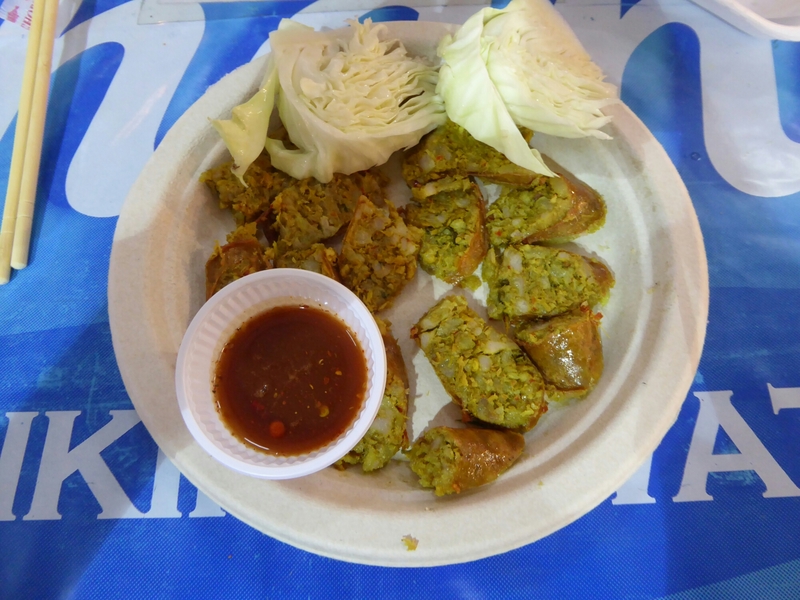 We then had some curries from a stall run by a Thai woman who spoke good English, her son lives on Isle of Wight. 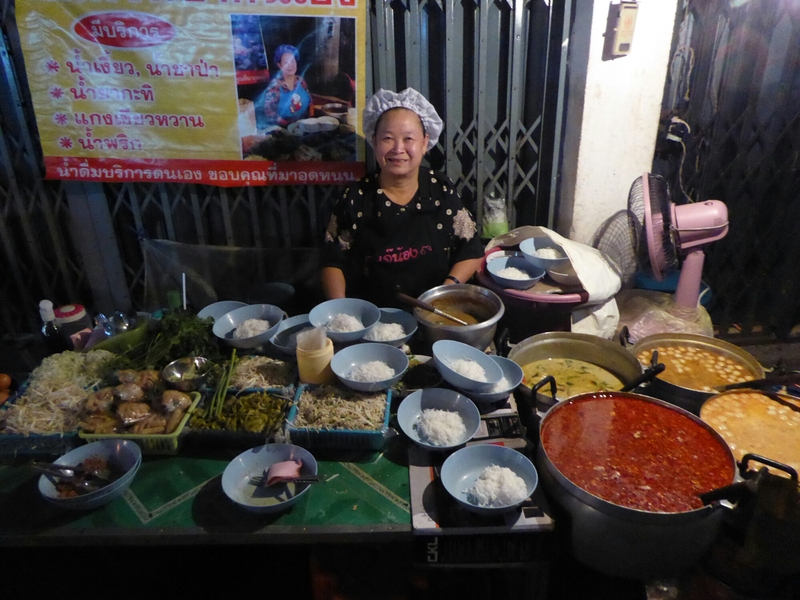 She has had the stall for 25 years, her coconut fish curry was really good. We also at a pork curry and green chicken curry, they were small portions, which is why we had 3. 30 Baht each, less than a £1. 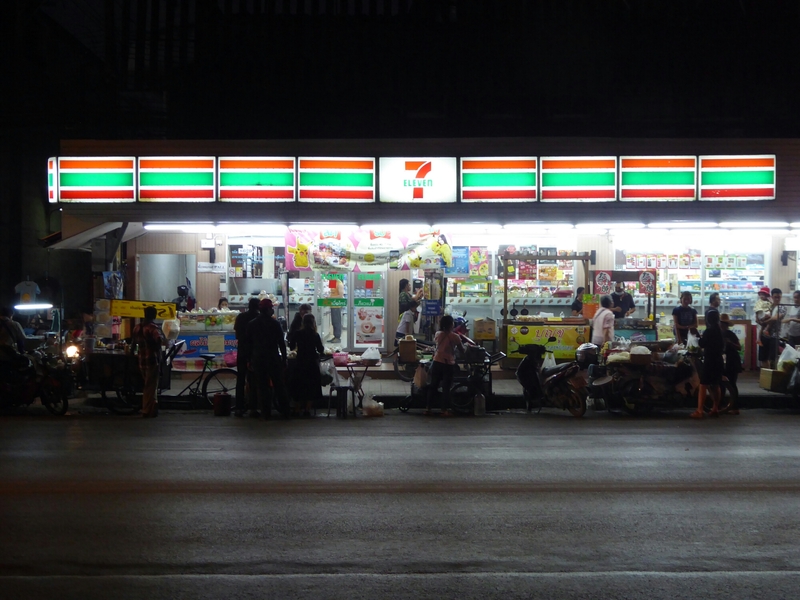 As we were close to the 7/11 which sold Tiramasu Magnum. I indulged again, Guy had an Oreo Corneto. 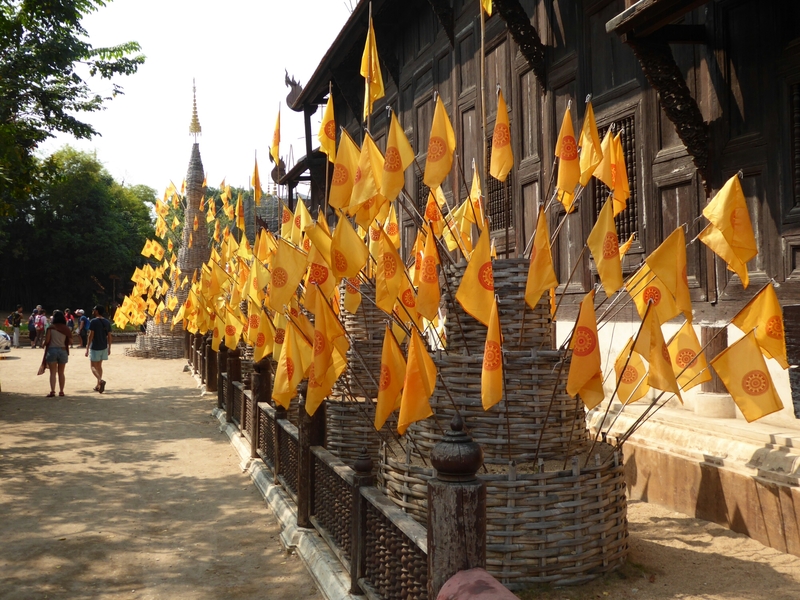 We are in Chang Mai for food and health, so set off to find Freedom Yoga so I can be flexible again. MapsMe said it was down the back streets 10 mins away from our place, but we managed to take closer to 30mins to get there! The menu is so tempting we stop for smoothies and breakfast of perfectly poached eggs on smashed arvo and sourdough bread. 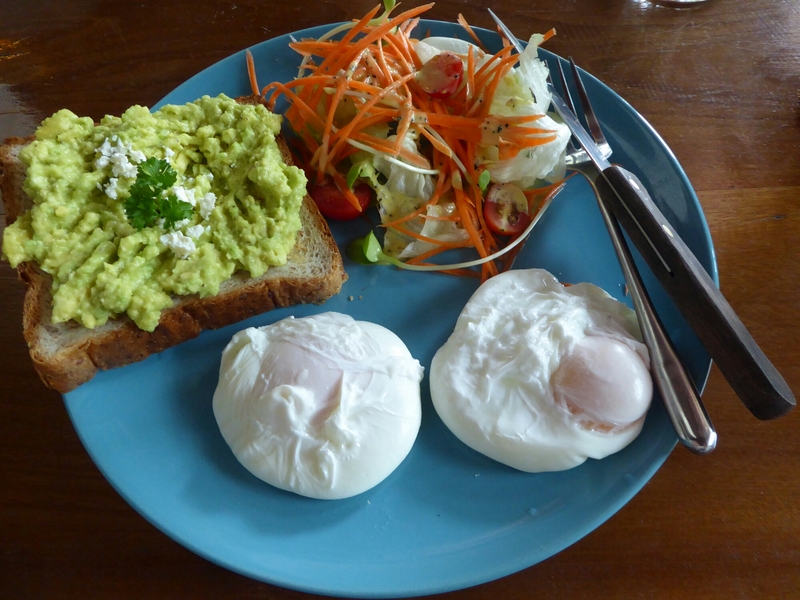 It is delicious, first soft poached egg for months, Guy is deliriously happy about smashed arvo. 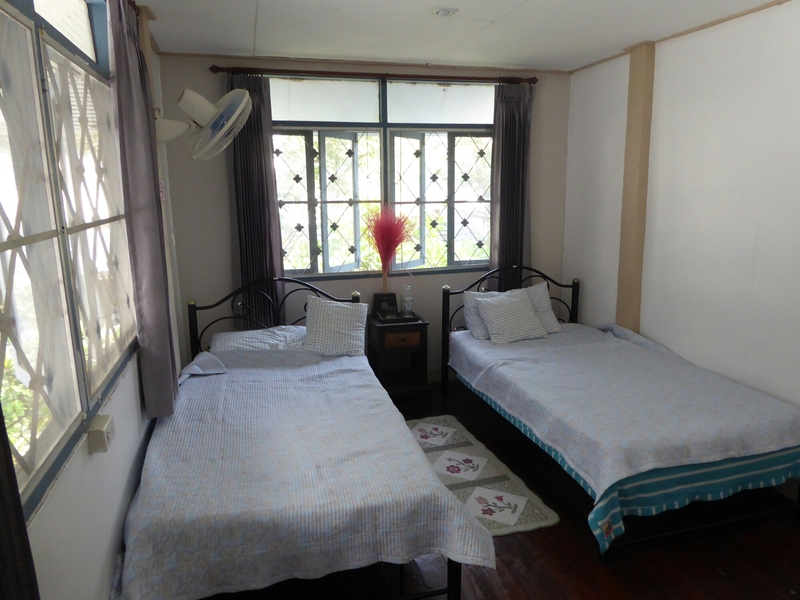 We then walk, slowly, across town to Yoga Tree, another place which does Qi Gong, as well as dance meditation, 3 day swirling courses and of course, yoga. 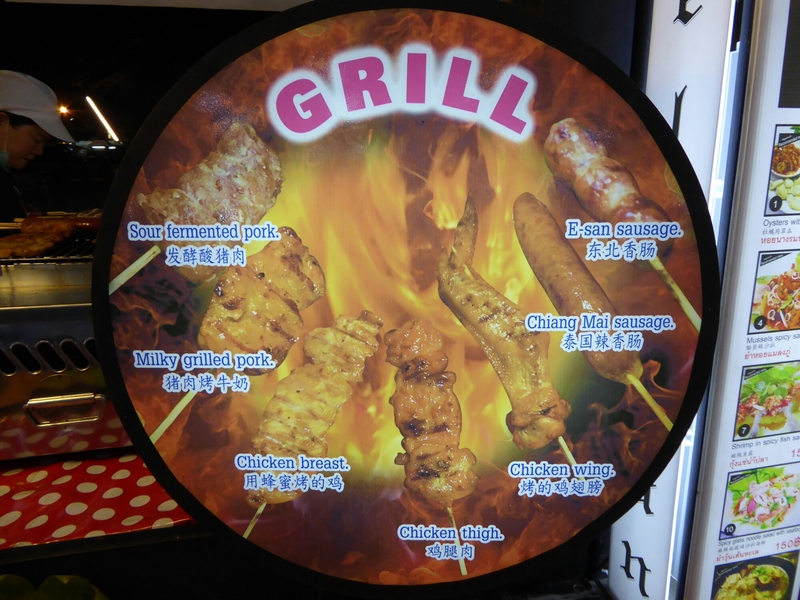 We had researched SP Chicken as a place to go for moist, tasty, BBQ chickens, although we weren’t starving, we were near the stall so went there for lunch. 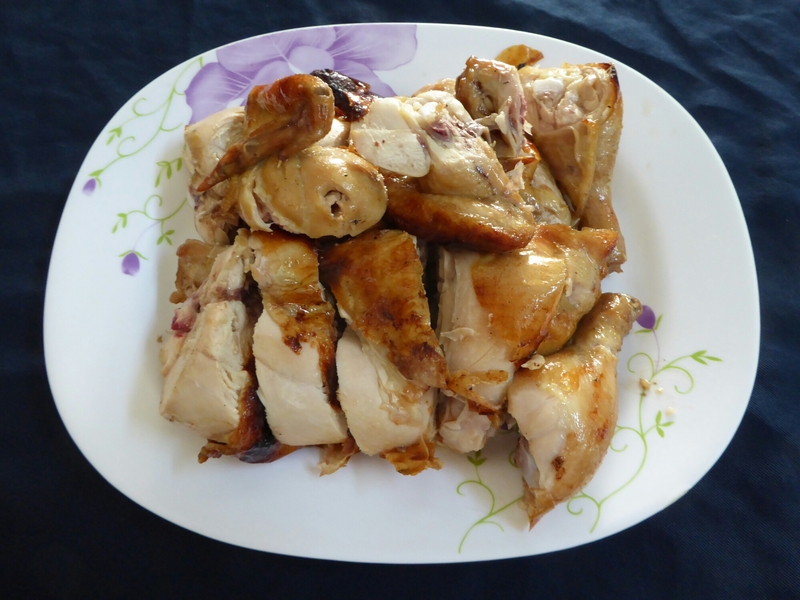 The chickens are small and perfectly cooked, with a garlic baste that repeated on us all afternoon. 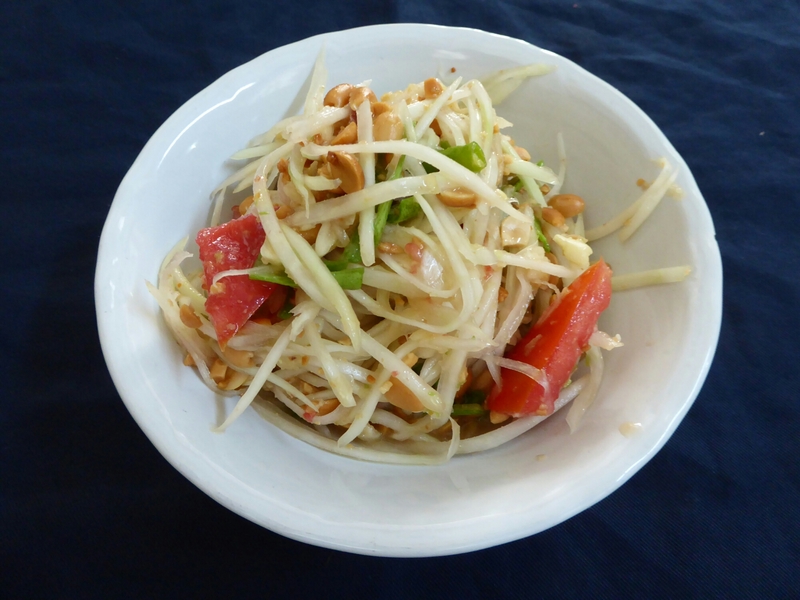 The Som Tam that accompied it was spicy with chilli and sour with plenty of lime and a good dash of fish sauce for umami. It was like being back in China, with a 30 mins queue outside the restaurant, and amusingly for us, the Thai staff telling the Chinese tourists to get in line, no queue jumping. 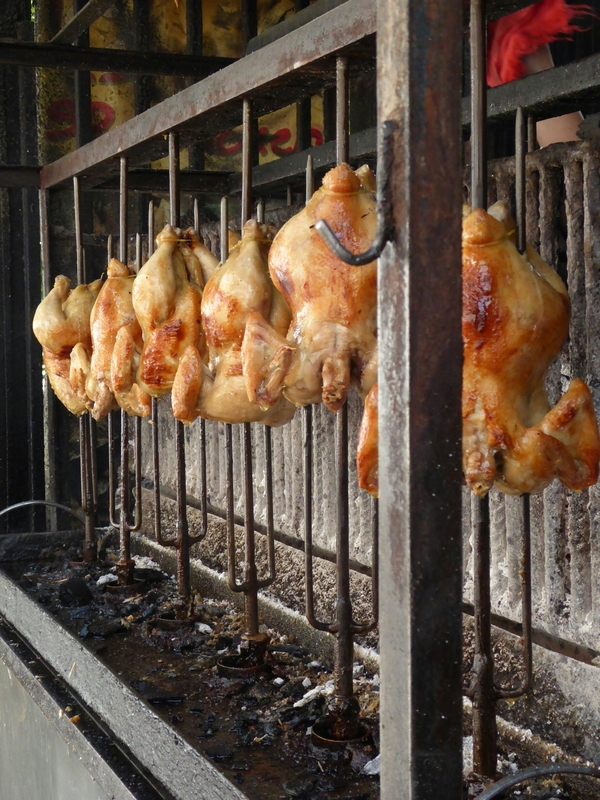 Guy spent the 30 mins taking photos of the chickens being slowly roasted, a lot of photos. 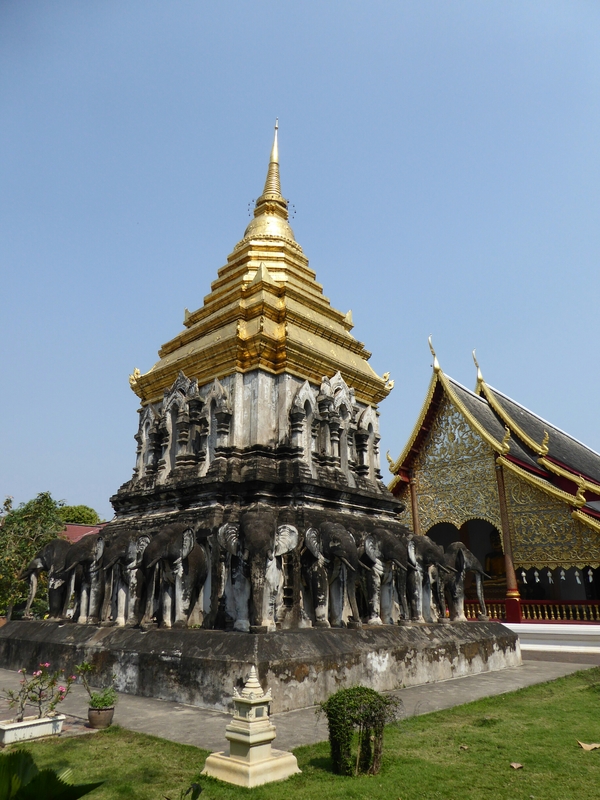 An amble back across town, stopping at Wat Phra Singh on the way. 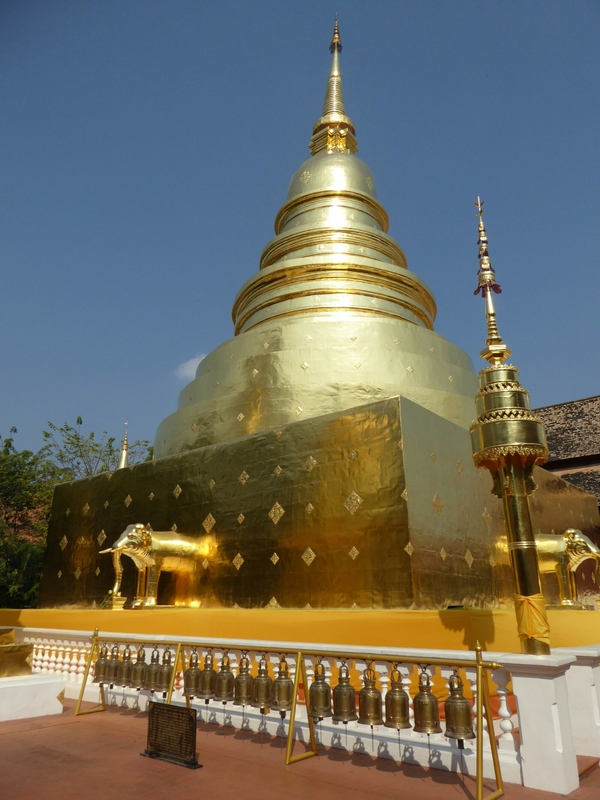 The protruding gold elephants are a new sight for us! We walk down the main street, stall holders are setting up for the Saturday Night market. We set off after dark to tackle it. It is a shuffle-a-thon. 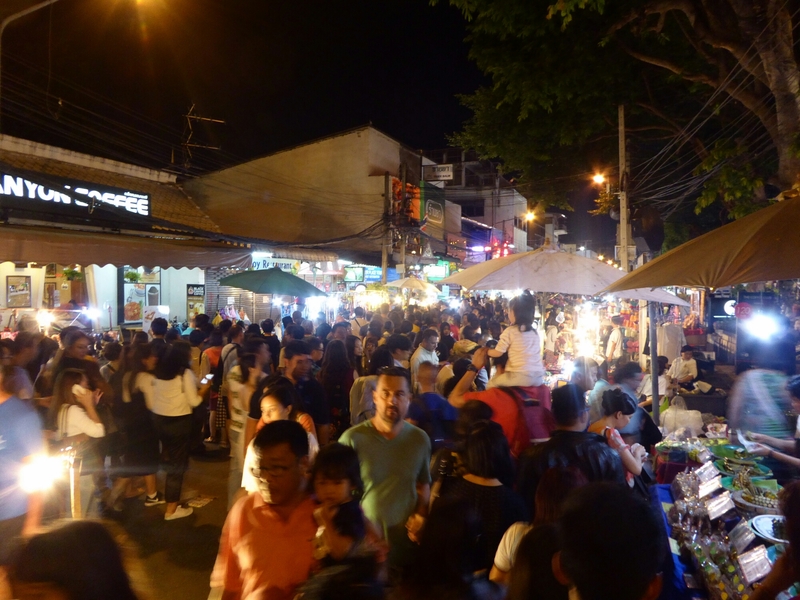 Throngs of people everywhere, stalls full of ethnic goods, and lots of things you don’t need as a backpacker. Guy bought some fancy fisherman trousers…. 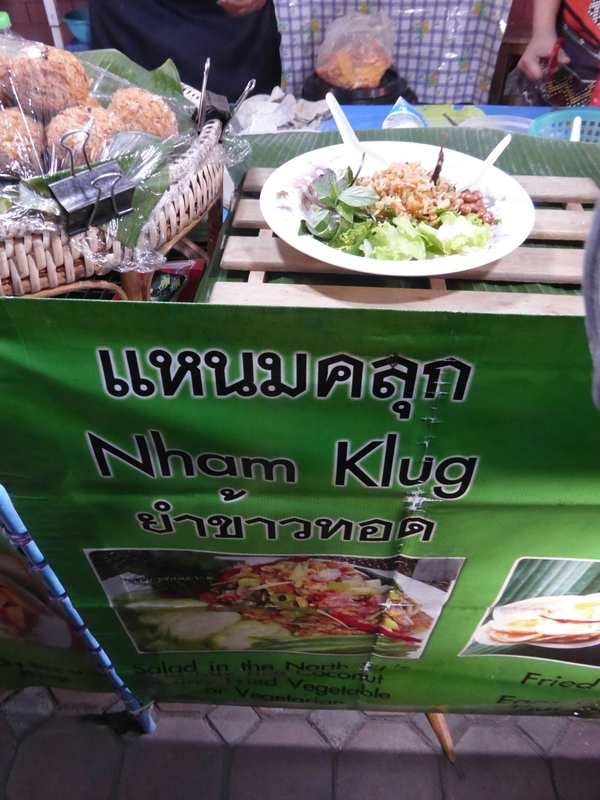 The food section of the market was set up in a Buddhist temple grounds, we did a circuit and listed about 8 things we wanted…. whittled it down to 3 and ordered a Nham Klug, stewed pork with pickles over rice, mango sticky rice and a bonus dish of coconut pancakes. They were all delicous, and eaten in seconds. 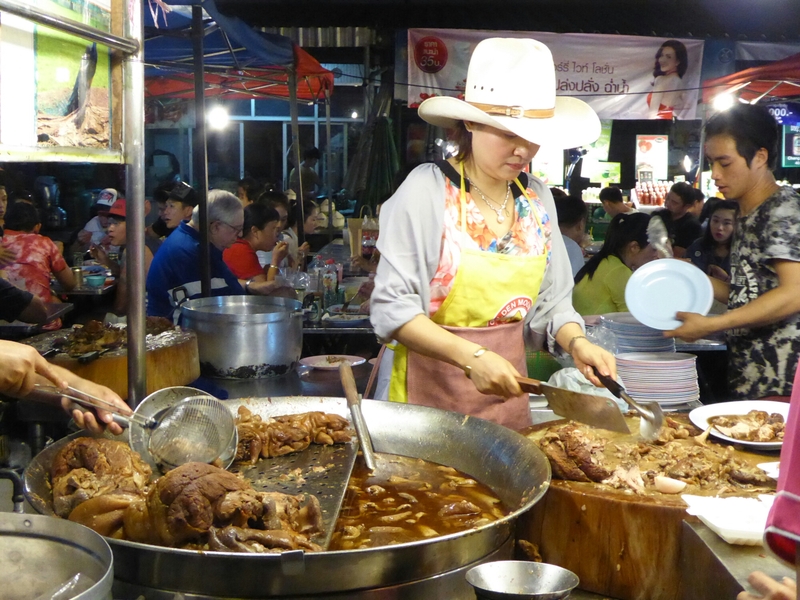 Chang Mai is the foodie paradise of Thailand, and it is a mystery to us as to why we have never come here before, loving Thailand and it’s food as we do. Still we are here now, slightly regretting never doing it before as it seems to be full of vegan cafes, single origin coffee houses, organic juice bars and lots, I mean lots, of avocados. 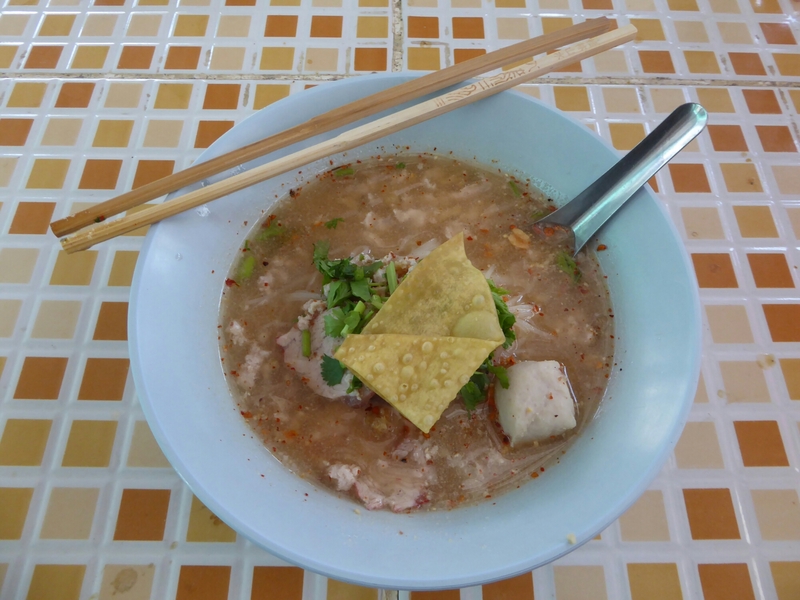 The Thai food has got somehow lost in the westernisation of the city. But with the help of various blogs and websites we will try and get some Thai food, with a few avocados thrown to ensure our omega 3 intake is healthy. Arriving at 8am was so much better than the advertised 6am giving us a 2 hour lie in on an uncomfortable bus. 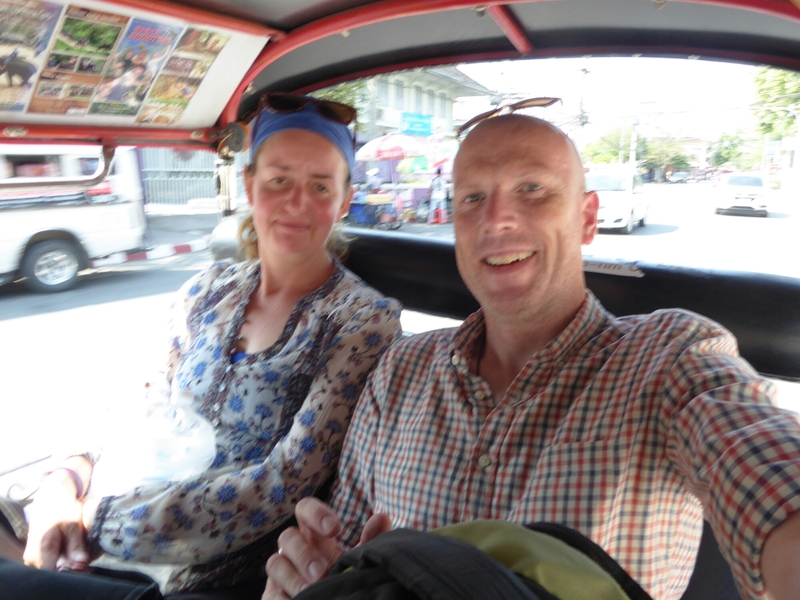 We decided to forgo waiting around with about 100 more westerners for a free songthaw ride to our hostel and walk the 500m ourselves. 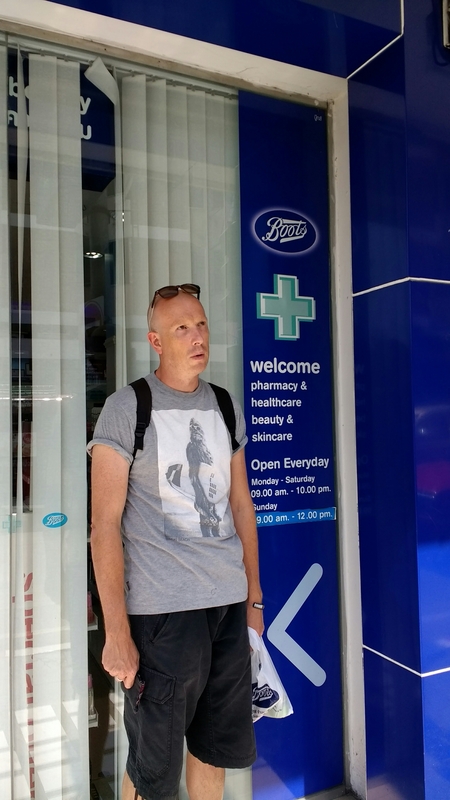 It was with a small leap of joy I realised we were around the corner from a Boots store……Guys heart sank, along with our budget. 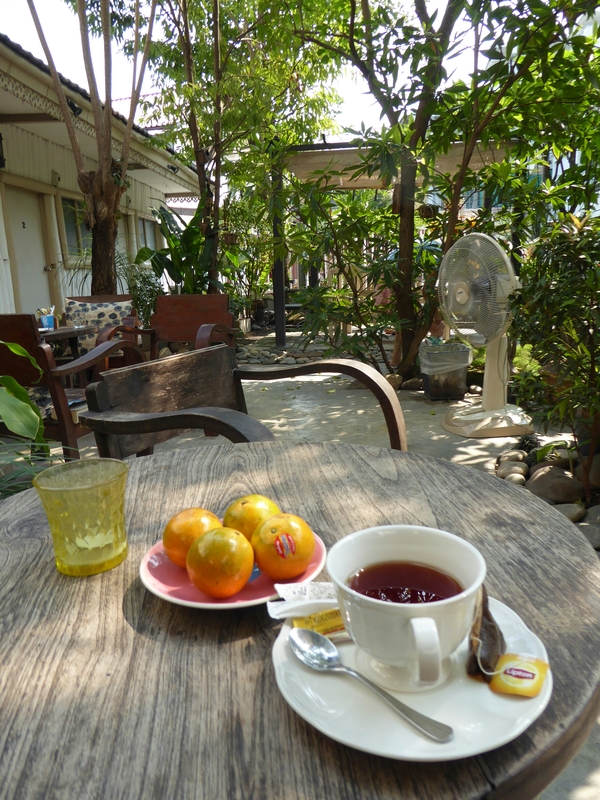 Our hostel, Stay With Me, is absolutely fab, more like a boutique hotel, clean, beautiful little garden, bar, fresh rooms. Only complaint is the amount of mossies, there are loads. We cover ourselves in citronella. After a while the caffeine kicks in and we are off to explore. The streets are slowly waking up, street vendors are coming out and setting up. 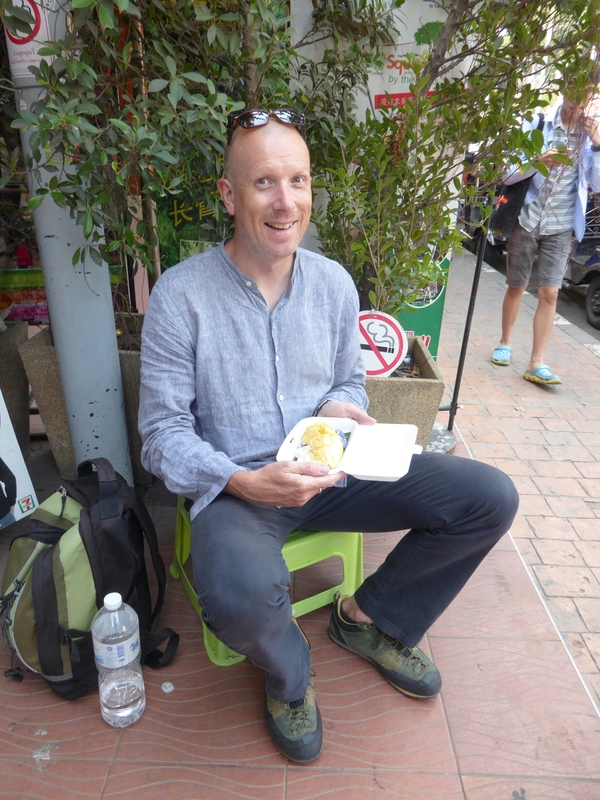 We see mango and sticky rice on offer, we perch on the tiny stools and snack. It is sweet, sticky and delicious. 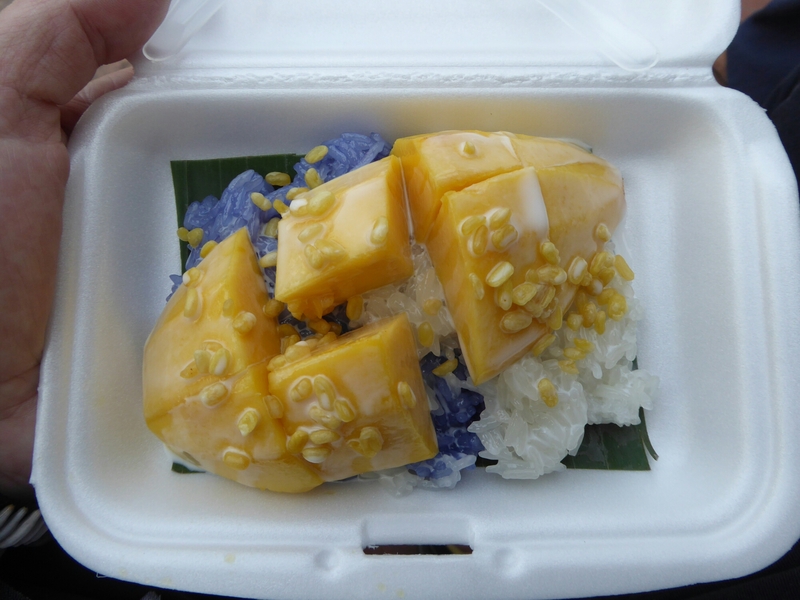 The blue rice is dyed with morning glory flower, all natural. We then see a Lanna cuisine restaurant. 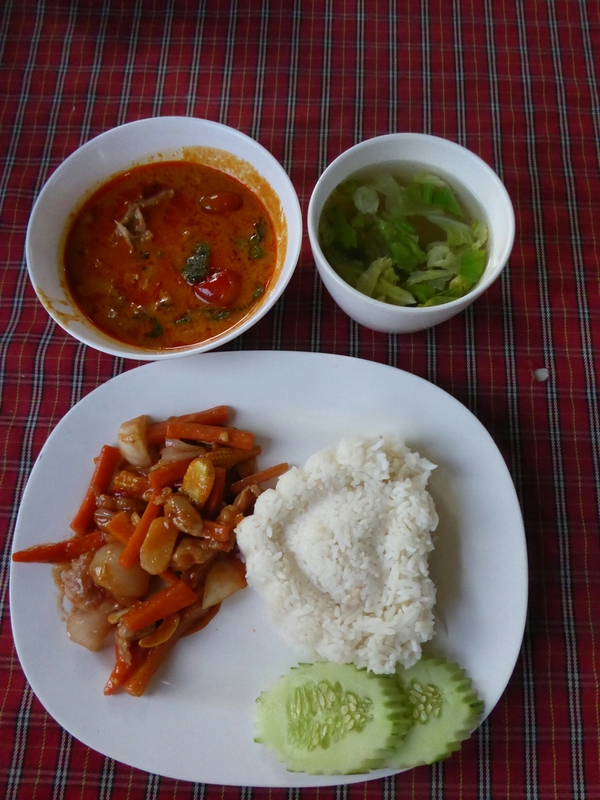 We order 2 dishes that are practically identical, pork and peanut curry and pork in spicy peanut sauce, both tasty and good. 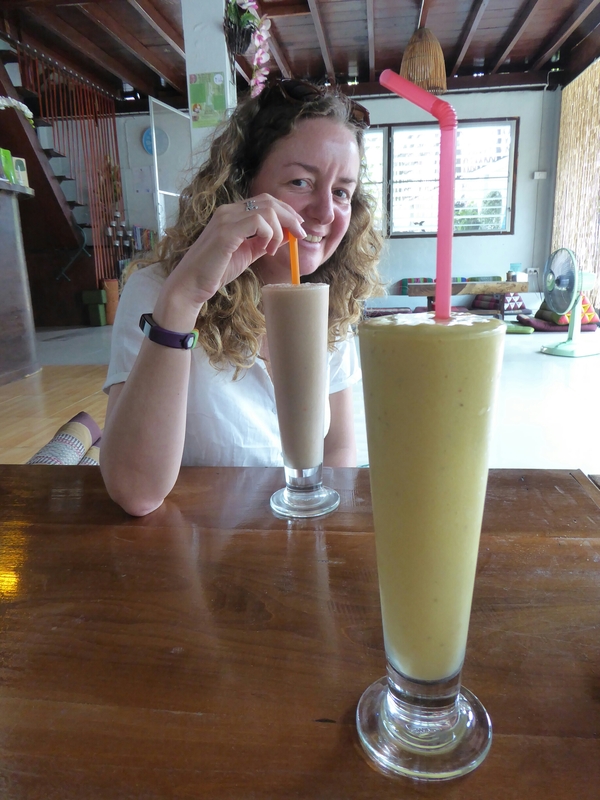 The requested coconut shake appears as a lime shake, but is still refreshing. There are loads of yoga, tai chi, chi gong etc schools here, we are looking for some chi gong on the advice of our tai chi master (yes, we are those kind of people now, who have a tai chi master 😎), it is harder to find than yoga. We find one, and also a yoga course. Our week of healthy living has begun!! It is a little cooler here, less humid, so wandering around the streets is still a slow process but less sweaty than Bangkok. 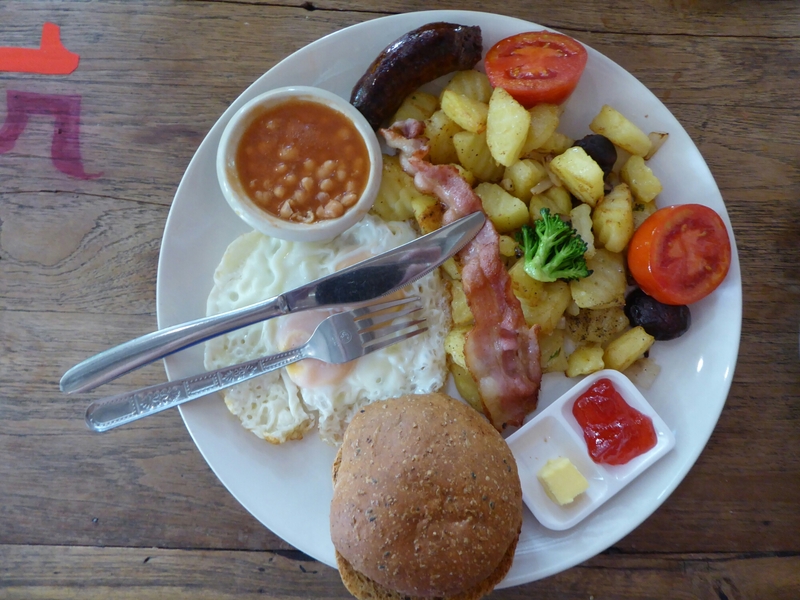 There are simply hundreds of cafes, restaurants, bars to choose from. We get back to ours and eventually check in, desperate for a shower I dive in. 1 min later I had killed at least 10 mossies. 2 in one go. Wow! A quick (!) shower later and I am out of there, leaving Guy to it. He comes back saying he only saw 1. 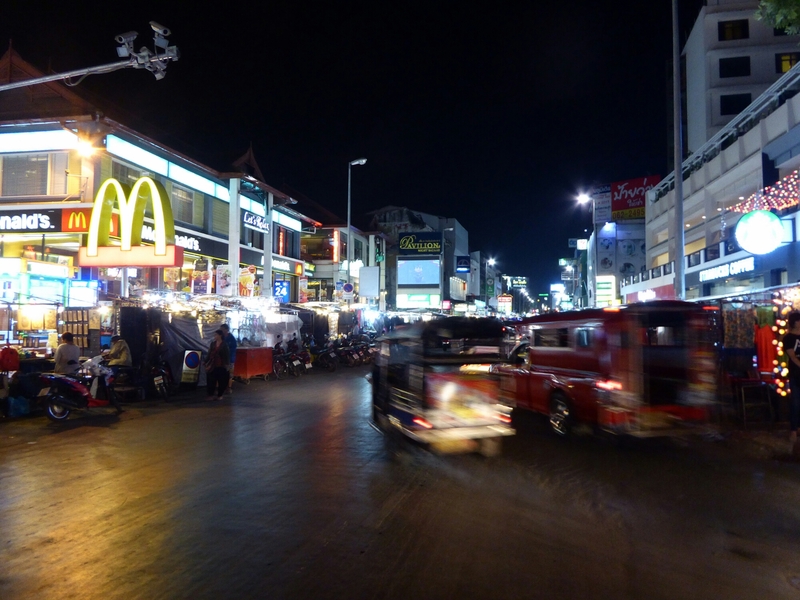 Saturday nights in Chang Mai have a night bazaar on close to our place. We wander around, following other westerners, to see it. A sanitised, western looking market is spotted, selling burritos, sushi, pancakes, and some Thai food, it feels like we are at a food festival in Leamington. 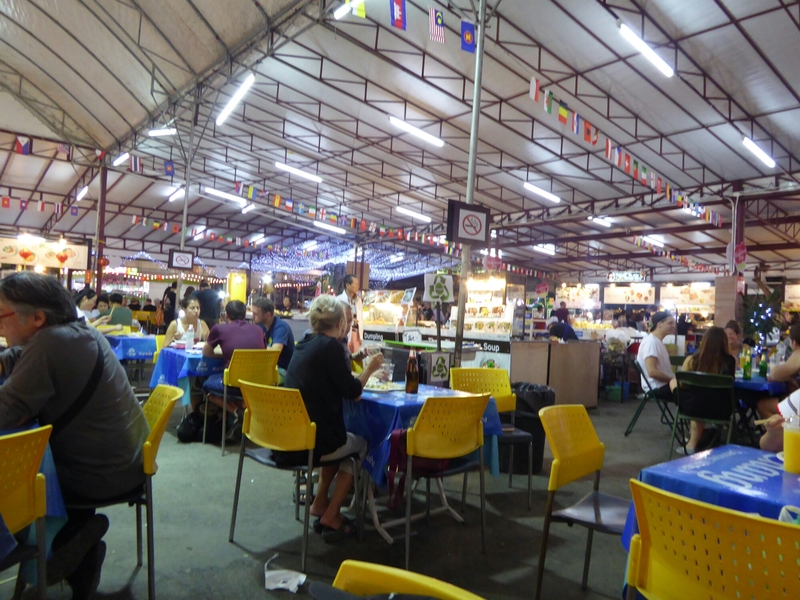 We walk out and find the real night bazaar, still pretty western but has more Thai food so we start snacking. First up is a pork platter. 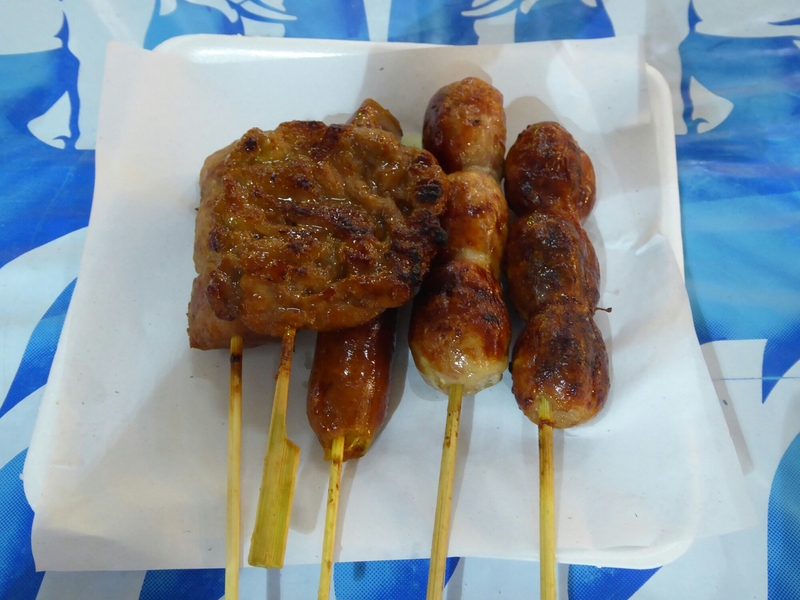 A Chang Mai sausage flavoured with lemongrass, milk pork, both of which are delicous. But the fermented pork divides us, it is sour tasting, Guy loves it. I don’t. 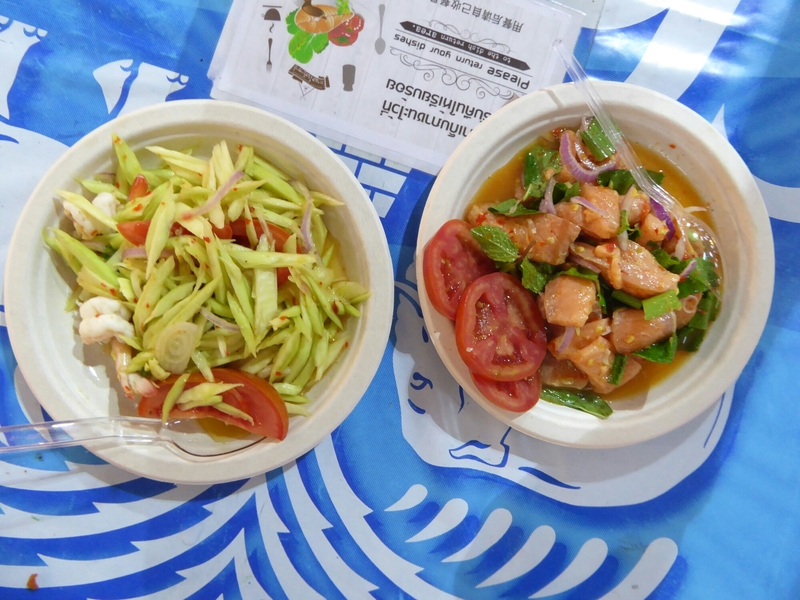 I chose a salmon with lemongrass salad, Som Tam salad made with green mango instead of papaya. Spicy and delicious. 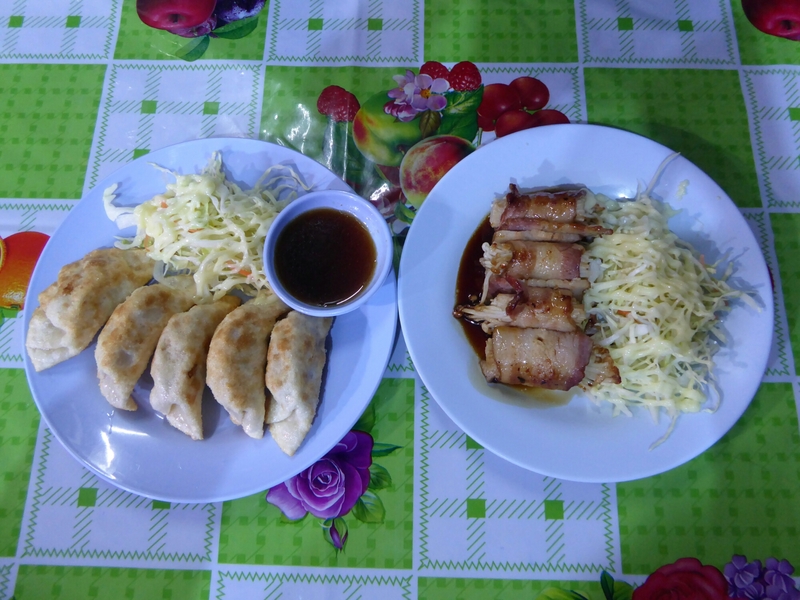 Guy has another Chang Mai sausage, with a side of raw cabbage, cabbage was not eaten. Guy finishes off with Khao Dong the local peanut coconut soup with chicken, fried noodle topping, this was quite sweet. 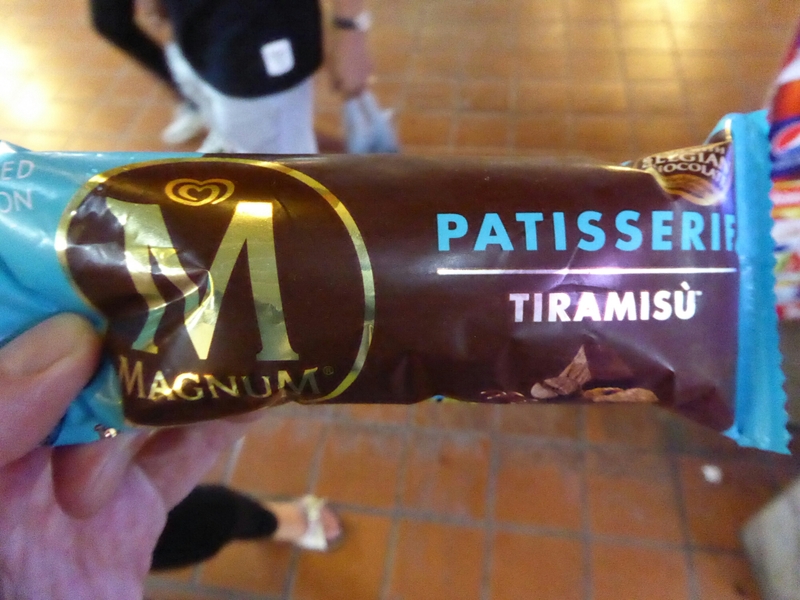 As if we weren’t full enough, Guy went and spotted a Tiramasu magnum in the 7/11. We couldn’t say no. It was fab. Obviously.